My name is Ryan. I am a follower of Jesus Christ and a pastor of a church plant in Worcester, England. In August 2001 I married my first wife, Annie, whom I met at a Christian youth conference in 1999. Four years into our marriage, Annie’s Mom was diagnosed with advanced breast cancer. And two years later, so was Annie. I was 32 years old when Annie was diagnosed and she was just 29. News of her cancer invaded our lives exactly one week before we were due to fly to the States for a year to study at a Bible college and possibly adopt a child. Our plans fell through and our world began a very different journey that we could never have anticipated – or wanted – when we made our vows to love one another through sickness and health. The following six years of our married life were painful – so very painful; yet they were so precious and so very wonderful. The wonder of them echoes through my life even as I write these words today, Tuesday, September 9th 2014. Suffering is one of those things that makes folks ask the questions that question God. Question His love; question His power; question His existence. Our experience of suffering drew us nearer to God. Suffering enhanced our experience of God. Annie knew suffering. She knew the agony of physical pain all through her body. She faced and endured the horror of it. She knew the unyielding assault of nausea and sickness. Cancer ravaged her body. She knew the pain of man’s attempts to rid her of the illness. She bore the scars – physically and mentally – of numerous procedures to eradicate the cancer that would not let her go. But she knew the love of her Father God who held her and guided her all the way through. In September 2011 she was given a terminal diagnosis. The cancer that we had hoped and prayed would leave her had returned as aggressive secondaries in her bones and lungs. The prognosis was not good but she outlasted the few months she was given. She spent every day of those following 18 months knowing Christ her Saviour and King more, enjoying Him more and sharing Him more with many others. In October 2011 we began this blog as a means of journalling the experience of life with cancer and with Christ. Our desire then was to share our experience in the midst of cancer. A real glimpse into the daily reality of what faith in Christ looks like during a crisis. We didn’t want to give this a retrospective treatment which could become so easily edited and smoothed. We knew life was short and hard and Christ was Lord and good. This is a story framed in real life, forged in the flames and founded on the fact of Jesus Christ risen from the dead! Cancer eventually took her life, but it could not take her hope, her peace and her joy because it could not take her Christ! I continued this blog as a young widower. Pain’s theme ran through my life and so did Christ’s reign. And so I continued to blog as I trusted Him through this really difficult time. Before Annie passed away she often talked to me about me getting married again after Jesus called her home. They were always very uncomfortable times because I didn’t want to imagine life without her. After the Lord called her home – three days after my 38th birthday – I resolved that having found one great woman, my remaining life would be lived out as a widower. But God had other plans and honoured the many prayers Annie had no doubt privately offered up for me regarding the future without her. God graciously provided me with the woman that I believed did not exist. A woman who would welcome my widowhood as heritage, not baggage. A woman who would continue to encourage and support me and love me in the work of serving Christ and His purposes on this earth. Our relationship blossomed in the Spring of 2014 and on August 9th 2014, Sarah and I were married. It’s hard to find the words to express how grateful I am to God for all that He has done. Having Sarah by my side in this new chapter of life truly is a blessing beyond measure. I thank God for her and love her dearly. I have no plans to continue keeping this blog updated. It was right to update it during the season of suffering. It continues to receive many visits each day and my prayerful desire is that it remains on the internet as a testimony to the fact that Jesus Christ is alive today. He alone has conquered the grave. His word on why the world is in the state it is, can be trusted. His promises can be relied on. The Bible makes sense of this world and gives lasting hope! Jesus uniquely has the power to give eternally lasting life, hope, peace and joy. We hope and pray that in reading this blog you may come to know this Jesus as your Saviour and King. Hi. I know Larry and Debbie. This past Sunday, Larry told me about Annie. I have been praying for both of you and will keep doing so. Our God is an awesome God! Nothing is too hard for God and nothing is better than His plan. Thanks Ry for doing this, I know how hectic things are around you guys at the moment, but we all appreciate the time and effort… Love you both LOADS. We’re praying for you down in Portsmouth. 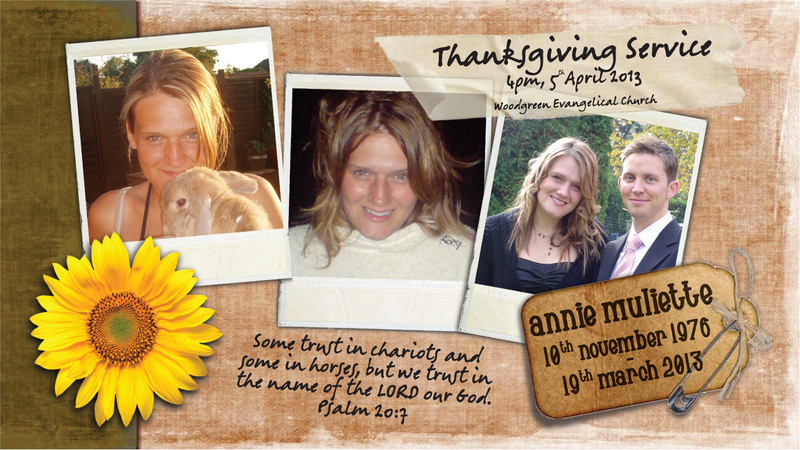 We continue to lift you both up to the Lord in our CU prayer meetings, and folk regularly ask after Annie’s health. Thanks for doing this Ryan. Grandmom has difficulty getting downstairs and I don’t have a laptop at this time to take upstairs, so I am printing your updates in large print for her to read. She is also reading them aloud to Grandpop. Aunt Kathy. Your two are amazing and a true inspiration to us all. We think of you constantly and we thank you for sharing this blog with us. How moving and humbling it is to read your daily blog, just want to say Thank You for taking the time to share your experiences. God Bless You both; I will try to remember to pray for Pearl tonight. Such a special time had with you and good friends today I was encouraged and blessed! Praying for you daily as you continue to serve our Lord and your community. What a mighty God we serve. Just wanted to let you know were praying for you in Nottingham. My trust is in him alone. Hi Ryan and Annie, we are praying for you both and for Annie to be healed. Thanks for writing this blog, it’s a great encouragement. We were just thinking about what God said to Paul: “My grace is sufficient for you, for my power is made perfect in weakness.” Praise the Lord! Hi Annie, Di has updated me on all your news. I’m heartbroken for you but know that your strong faith will see you and Ryan through. I think of you every day and pray for you both. I am from Twickenham and heard about this because i know a few people at Hayes. You will be very much in my prayers. Praise God that we are chrsitians and you do not have to go through this alone. He is with you and is Sovereign. His grace is sufficient. It’s been awhile since we met, but you influenced the group of USA college and high students we brought to work with the Kinemans several years ago. You both are an inspiration as I read about this journey. You words have touched my life and very timely because I have a sister who’s cancer just returned right before Christmas. So thanks for ministering to others during this tough time. We’re praying for you from Joplin, Missouri. Hi Ann and Ryan, my name is Frank, from Poland, I have been a friend to Ruthie and John, and somewhat to Ann and Tim. I want to pass my best greetings and regards. Also to assure you that we also remember you, in this increadibly difficult life situation. Yet you both are able to give honor and praise to the Creator of Life and Salvation. You become an amazing testimony of Christian faith. I had no idea until just now. My thoughts are with you. If you want help with absolutely anything please contact. Love to you both. Steve. i was on the CIY trip with brenda [commented above] and met you both when we visited the kineman’s in the summer of 2004.
please know that you have been in my thoughts and prayers often! i am so encouraged by your faith, and thank you for sharing your heart in the midst of your pain. Grace to you both in the matchless name of Christ Jesus, amen! Let me just introduce myself, my name is Joshua Bolaji, and I am the pastor at Welkom Baptist Church in South Africa. I have had the pleasure of meeting two people you know, Sarah Wilkins and Naomi (who I understand used to be part of your youth group). Sarah has been sharing about you both and your remarkable faith and testimony in the face of adversity. We continue to stand with you in prayer. In addition, I would just like to encourage you both concerning the impact of your ministry. This comes in the shape of Naomi, who was a breath of fresh air during her stay with us here in Welkom. Her attitude, her spirit, and grasp of the Scripture was brilliant; I had to ask, who is your pastor? To which both her and Sarah responded, Ryan and Annie. We will continue to pray for and with you both. I can testify that there are many such wonderful young people who have grown up under Ryan and Annie’s leadership . Ryan and Annie have both had a major impact on the youth of our church, and it has been such a blessing to see so many of them grow up in the Lord. Three of them are my own children and I have often thanked God that He allowed our paths to cross at such a critical time in their lives. I’ve said it before, but it’s worth repeating, thank you so much Ryan and Annie. It was so good to meet you both at Rora and we were so blessed by the whole week, not least spending time with you two. Sorry we didn’t say goodbye but there were so many to get round! We’re praying for you daily and know you feel His touch and grace in every situation. I am so sorry to hear this. You and your family will be in my thoughts and prayers. I have a quick question about your blog, would you mind emailing me when you get a chance?